I love nail polish with a gimmick. These Jessicas come in little paint cans! How cute is that? They also have some that come in teddy bear shaped bottles like the old Fing'rs polishes (I'll post those soon too). Though, unlike most products that have a gimmick, the colors/product are actually quite nice. Funkytown. I know that there are a lot of these types of glitters- the blue/pink/purple glitter in a clear base combination. This one, though, is the prettiest of them all. I don't know why but this one sparkles way more than the others I have like this. Maybe they use a special kind of glitter, I don't know, all I know is that this one is blindingly sparkly and I love it. Girls Night Out. My least favorite of the bunch but still not bad. Much nicer in real life. 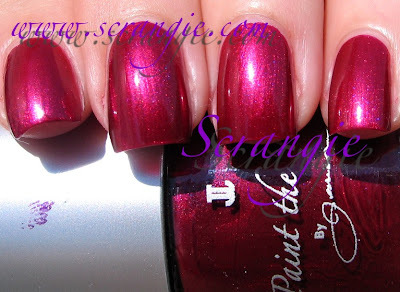 It's a cranberry red shimmer. It has more depth of finish and color but I couldn't seem to capture it. This shade of berry red does weird things to my camera. Pajama Party. Awesome color. Hard to photograph. Let me describe. 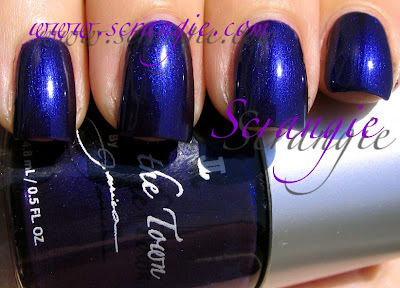 It's a dark blue-based purple base with strong blue shimmer. It sits on the color like a flash or duochrome but it doesn't really shift with the angle. It's more like a blue overlay. 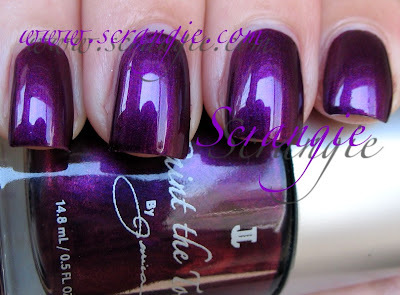 It reminds me a lot of the old Jane polish Gem X if you remember that one. Scene Stealer. A nice teal shimmer. Color is more accurate in the indoor picture. Sunlight picture shows the reflective metallic qualities of the finish. Shake Your Booty. I love this name. It makes me want to wear it just because of the silly name. Besides, how many polishes do you know of with the word 'booty' in the name? Ignore the fact that I can't stand the word booty unless it is referring to something a pirate obtains. Anyway... pretty standard medium blue shimmer with green accents. Seems like I see this color a lot. Not a bad shade, just a little common. Shopping Spree. THIS is my favorite of the collection. It looks like velvet on the nails. 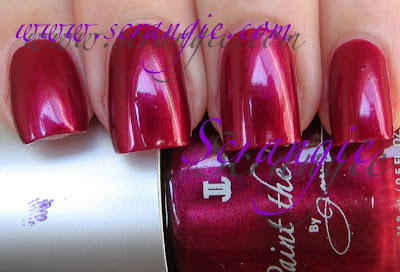 It's a shimmering red-based purple and it has so much depth. Reminds me of China Glaze Cowgirl Up. It's so pretty. Formula on these is okay, a little bit runny and sheer on some shades. I did three coats of all and all of them needed the third. Application is a little tricky because the brush doesn't like to conform to my nails or flex as easily as I think it should. Drying time is long. Love the paint can bottles. We need more cute shaped bottles. I want someone to make some old retro looking bottles with the fancy elongated handles and really intricate designs on the glass, maybe like an Anna Sui or KO bottle. I love pajama party one. Reminds me of the winter, somehow. Oooh. I really like Funkytown! I bet it would look cool layered over Pajama party too! I'm a sucker for unusual bottle designs too! Shopping Spree caught my eye as well. Those sorts of red-based purple/black cherry shimmers are something I hardly have in my collection (for no adequately explained reason). *** DROOL *** These are some fantastic colors! There was not one color I didnt like. These are so so pretty especially the glitter color. Are these out yet? I can't find them on the Jessica Cosmetics website. Funkytown and shopping spree are very nice! Can you post pics of the bottles? Shopping Spree is my FAVE of the collection! Shopping Spree is a beauty! The rest are pretty.